and the movie of the primary mandibular first molar. The aim of this study was to assess the efficacy of removing the filling material from oval-shaped canals with rotary retreatment files, with or without the additional use of self-adjusting file (SAF), using micro-computed tomography. Oval-shaped canals from 20 maxillary premolars were prepared and assigned to two groups (n = 10), according to the obturation technique: cold lateral condensation (CLC) or vertical condensation (VC). Then, retreatment procedure was performed with retreatment rotary instruments followed by SAF. 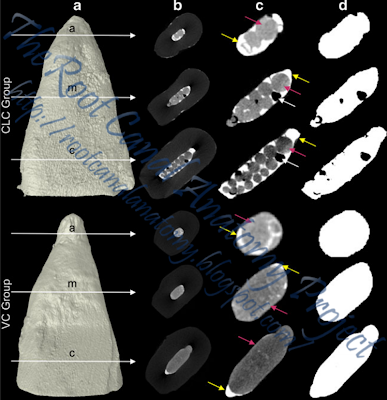 The specimens were scanned after each procedure and the volume of the filling material calculated. Median and interquartile range (IQR) percentages of the remaining filling material after each retreatment technique were statistically compared by Wilcoxon and Mann–Whitney U tests with a significance level of 5 %. The median percentage volume of the filling residue after rotary retreatment procedure was 1.59 (IQR = 1.26) and 0.42 (IQR = 0.86) in the CLC and VC groups, respectively (p < 0.05). After the use of SAF, the median percentage was 1.26 (IQR = 0.75) and 0.12 (IQR = 0.53) in the CLC and VC groups, respectively (p < 0.05). Statistically significant difference was also observed within the group after the additional use of SAF (p < 0.05). None of the retreatment procedures completely removed the filling material. The additional use of the SAF improved the removal of filling material after the retreatment procedure with rotary instruments. Filling material left after retreatment procedure may harbour necrotic tissue and bacteria, which could lead to a persistent disease and reinfection of the root canal system. The additional use of self-adjusting file after the conventional retreatment procedures may improve root canal cleanliness, allowing a better action of the irrigating solution. 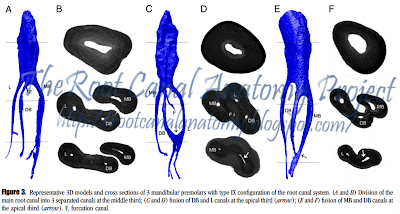 This ex vivo study evaluated the disinfecting and shaping ability of 3 protocols used in the preparation of mesial root canals of mandibular molars by means of correlative bacteriologic and micro–computed tomographic (μμCT) analysis. The mesial canals of extracted mandibular molars were contaminated with Enterococcus faecalis for 30 days and assigned to 3 groups based on their anatomic configuration as determined by μCT analysis according to the preparation technique (Self-Adjusting File [ReDent-Nova, Ra’anana, Israel], Reciproc [VDW, Munich, Germany], and Twisted File [SybronEndo, Orange, CA]). In all groups, 2.5% NaOCl was the irrigant. Canal samples were taken before (S1) and after instrumentation (S2), and bacterial quantification was performed using culture. Next, mesial roots were subjected to additional μCT analysis in order to evaluate shaping of the canals. All instrumentation protocols promoted a highly significant intracanal bacterial reduction (P < .001). Intergroup quantitative and qualitative comparisons disclosed no significant differences between groups (P > .05). As for shaping, no statistical difference was observed between the techniques regarding the mean percentage of volume increase, the surface area increase, the unprepared surface area, and the relative unprepared surface area (P > .05). Correlative analysis showed no statistically significant relationship between bacterial reduction and the mean percentage increase of the analyzed parameters (P > .05). The 3 instrumentation systems have similar disinfecting and shaping performance in the preparation of mesial canals of mandibular molars. The newly developed single-file systems claimed to be able to prepare the root canal space with only 1 instrument. The present study was designed to test the null hypothesis that there is no significant difference in the preparation of oval-shaped root canals using single- or multiple-file systems. Seventy-two single-rooted mandibular canines were matched based on similar morphologic dimensions of the root canal achieved in a micro–computed tomographic evaluation and assigned to 1 of 4 experimental groups (n = 18) according to the preparation technique (ie, Self-Adjusting File [ReDent-Nova, Ra’anana, Israel], WaveOne [Dentsply Maillefer, Ballaigues, Switzerland], Reciproc [VDW, Munich, Germany], and ProTaper Universal [Dentsply Maillefer] systems). Changes in the 2- and 3-dimensional geometric parameters were compared with preoperative values using analysis of variance and the post hoc Tukey test between groups and the paired sample t test within groups (α = 0.05). Preparation significantly increased the analyzed parameters; the outline of the canals was larger and showed a smooth taper in all groups. Untouched areas occurred mainly on the lingual side of the middle third of the canal. Overall, a comparison between groups revealed that SAF presented the lowest, whereas WaveOne and ProTaper Universal showed the highest mean increase in most of the analyzed parameters (P < .05). All systems performed similarly in terms of the amount of touched dentin walls. Neither technique was capable of completely preparing the oval-shaped root canals. This study aimed to describe the anatomy of mandibular premolars with type IX canal configuration by using micro–computed tomography. 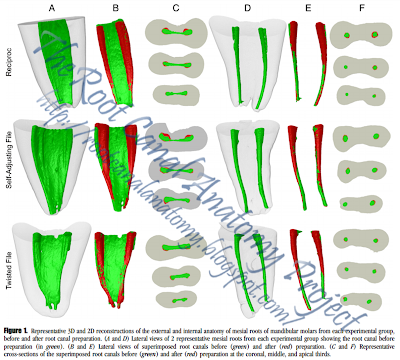 Mandibular premolars with radicular grooves (n = 105) were scanned, and 16 teeth with type IX configuration were selected. Number and location of canals, distances between anatomic landmarks, occurrence of apical delta, root canal fusion, and furcation canals, as well as 2-dimensional (area, perimeter, roundness, major and minor diameters) and 3-dimensional (volume, surface area, and structure model index) analysis were performed. Data were statistically compared by using analysis of variance and Kruskal-Wallis tests (α = 0.05). Overall, specimens had 1 root with a main canal that divided into mesiobuccal, distobuccal, and lingual canals at the furcation level. Mean length of the teeth was 22.9 ± 2.06 mm, and the configuration of the pulp chamber was mostly triangle-shaped. Mean distances from the furcation to the apex and cementoenamel junction were 9.14 ± 2.07 and 5.59 ± 2.19 mm, respectively. Apical delta, root canal fusion, and furcation canals were present in 4, 5, and 10 specimens, respectively. 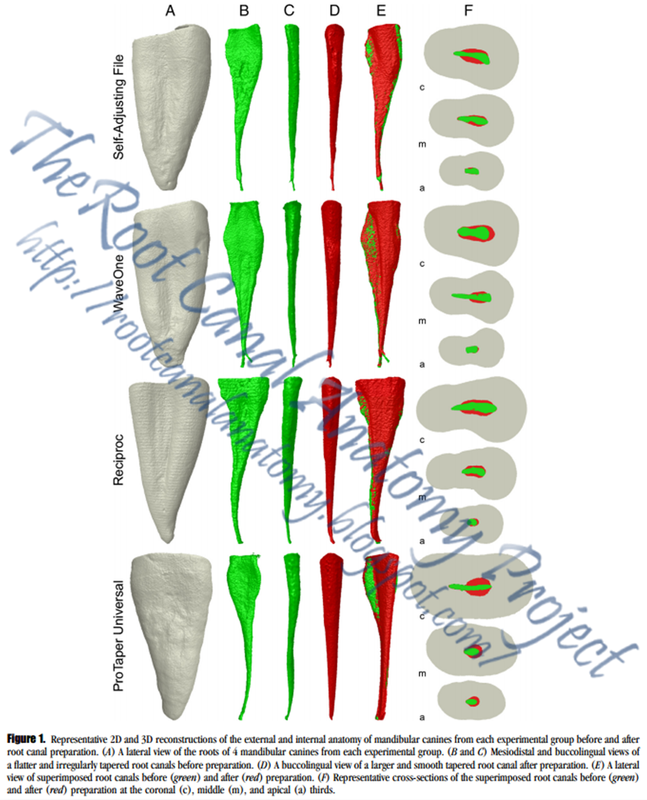 No statistical differences were found in the 2-dimensional and 3-dimensional analyses between root canals (P > .05). 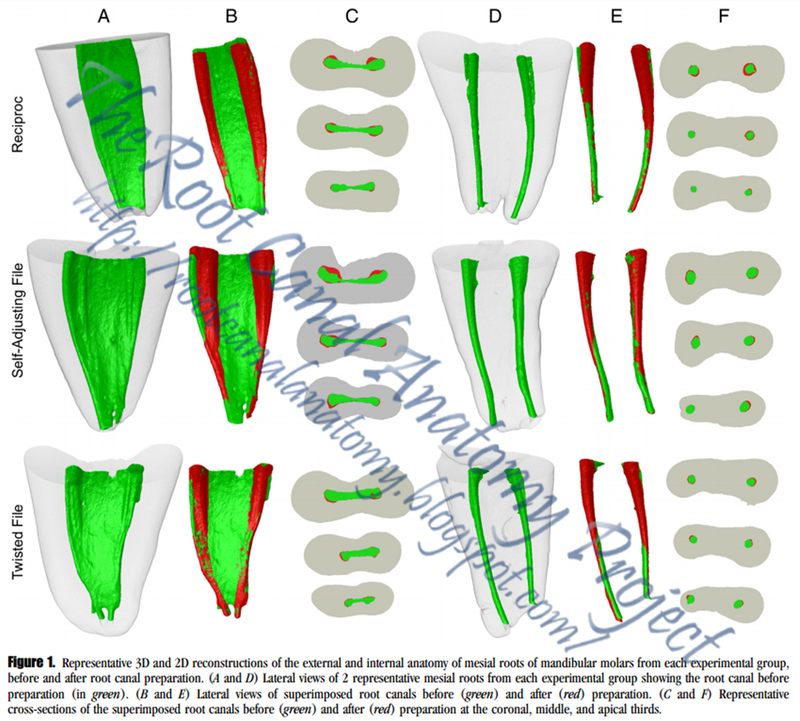 Type IX configuration of the root canal system was found in 16 of 105 mandibular premolars with radicular grooves. Most of the specimens had a triangle-shaped pulp chamber. 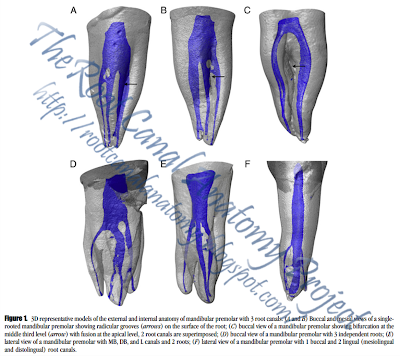 Within this anatomic configuration, complexities of the root canal systems such as the presence of furcation canals, fusion of canals, oval-shaped canals in the apical third, small orifices at the pulp chamber level, and apical delta were also observed.